UK, 1961, 91 minutes, Black and white. Patrick Mc Goohan, Marti Stevens, Betsy Blair, Keith Michell, Richard Attenborough. Producer Michael Ralph and director Basil Dearden had made many socially conscious films in the 40s and 50s. These include police dramas like The Blue Lamp and race dramas like Sapphire. They had also opened up issues like homosexuality in Britain with Victim and, soon after, they made this update of Shakespeare's Othello, set in the difficulties of race relationships in central London. 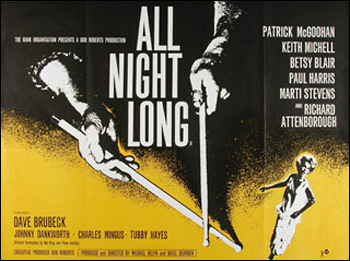 The film also has a jazz background, with appearances by such players as Dave Brubeck, Tubby Hayes, Johnny Dankworth. Marti Stevens appears as a jazz singer, married to Paul Harris, the Othello figure, and the subject of infatuation and obsession by Patrick Mc Goohan. The film echoes the theme of Othello in its interracial jealousy and violence. The film was also shot in black and white, in the tradition of the American film noir of the 40s. 1. Interesting and entertaining melodrama? British filmmaking in the 1960s slice of life? A jazz musical? Updated variation on Othello themes? 2. The cinematic styles in Britain in the '60s: black and white photography, light and shadow? The authentic locations? The nightlong party? The pace and editing? The movement and moods of the party? The jazz score and performance? The interests in the slice of life and the melodramatic aspects? Music and language? The atmosphere of the period? 3. Audience response to the basic plot: the focus on Rex and Delia, situation, types? Johnny and his manipulation and manoeuvres? Destroying Rex and Delia? Self-destruction? 4. The film as an adaptation of Othello: the situation of Rex and Delia and Johnny, the setting of the musical world, basic drives of ambition and success, the adaptation of the characters, the adaptation of the names? Appropriate parallels? How well did they work? Audiences noticing them, appreciating the cleverness? How persuasive the parallels? The changes? 5. The atmosphere of the jazz world? The reputation of the players, their skill with their instruments? Bands and groups? Singers and agents? The real-life stars e.g. Dave Brubeck, Johnny Dankworth (with the mention of Cleo Laine)? Atmosphere of realism? 6. The establishing of atmosphere with the party: Rod, the situation for the party, preparations, the caterers, the waiter acting as sentry, the guests arriving, the vitality? The device of having the action take place over one night, all night long? 7. The focus on Rex and Delia? The poster advertising their performance? The celebration of the anniversary? Their marriage, respective careers? Work? Their love, celebration? Their ease with one another? The significance of the marriage between black and white? Rex and his strong personality, presence? Success? The admiration of his friends? The relationship with Johnny? His potential for being Johnny's victim? The parallel with Othello? His credulity, potential for jealousy, suspicion? His succumbing to the process of the hints and interpretation? Jealousy of Cass, misinterpreting information about his girlfriend? Emily? The growing susceptibility, violence? The attack on Delia? Pushing Cass over the railing? The revelation of the truth, Emily's stances? The effect on him - the death of humiliation? The attempted killing of Delia? His not killing her? The tragedy, without the bloodshed and death? The humiliation? Professional humiliation and jealousy? The racial antagonism? The catharsis of self-enlightenment through humiliation? The peace of the ending? 8. Delia as an attractive heroine, love for Rex, popular? The discussions about her career? Her singing and its quality? Surprising Rex? The discussion about deals ? especially with Johnny? Her turning them down? Her being attacked by Rex? Her pain, audience expecting that she had died? Surviving, the reconciliation and peace? 9. Patrick Mc Goohan's sinister presence and voice as Johnny? In himself, music, the phone call to the agent, his plans, type? Malevolence? Hints? The parallel with Iago? The effect on Rex and his choking Delia? Emily revealing him as a liar? Her confronting him and his rejecting her? Her love for him and his inability to be loved? His being exposed? His playing the drums in a kind of self-centred frenzy? His motivation? Jealousy, racial differences, evil? 10. Rod as the pleasant host, the man about town, making the party go? Cass and his friendship, girlfriend, the suspicions of Rex, his genuine friendship with Rex and Delia, the attack and his being hurt? Forgiveness? 11. Emily and her care, humiliated by Johnny, the party, friendship with Delia and Rex, her being hurt, telling the truth, declaring her love, rejected by Johnny? 12. The effectiveness of Shakespeare's melodramatics in a contemporary situation? Tragedy without bloodshed? Catharsis and self-awareness? The comparisons between 16th. century and 20th. century, Venice and London? Shakespeare's poetry and 20th. century jazz? An ending which enabled the characters to live rather than die? Satisfying resolution? 13. The classic themes of love, pride, credulity, jealousy, malevolence?